Both sheds had a similar, unusual geometrical form. The ABC report was interesting because of the amount of detail on the building that was included. The text is reproduced here for the record with a link to the Deeargee shed review. The Isis Downs shearing shed is open today between 9am and 5pm. A renowned shearing shed in Queensland's west will open its doors to the public for one day only as it marks its centenary. 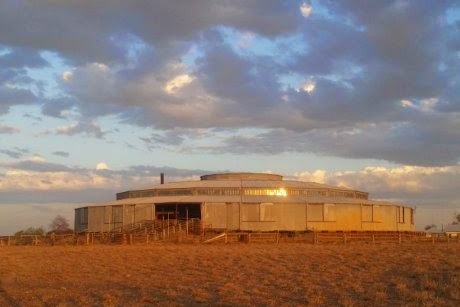 Construction on the Isis Downs shearing shed, a semi-circular woolshed at Isisford, south of Longreach, began in 1913 and was completed in 1914. 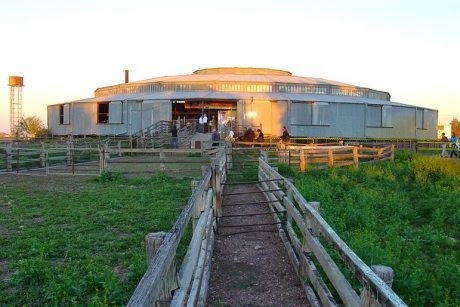 It has a unique design and is known as one of the largest early twentieth century shearing sheds. Isisford is also holding horse races tomorrow, and the Isisford Race Club has worked with the station's owner to enable visitors to tour the woolshed today between 9:00am and 5:00pm. Visitors were once able to view the building, but it has been off limits for a number of years. Engineer historian Ian Waples has researched the shed and said it was the only example of its kind in Australia. "Well I think what is special about it is the design to start with, it's very unusual the design, it is a semi-circular shed," he said. "The original design was a 52-stand shed, so it was a massive exercise [to build]. 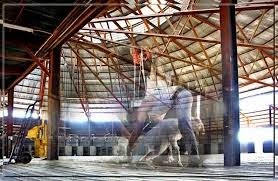 "It's all steel construction, except for the floor and that is very unusual in woolsheds, they are usually just all timber. "This one has got a centre pole in the middle of the structure and all the trusses radiate out from the central pole, so to be inside it, it is a really magnificent building." Mr Waples said it would also have been a huge challenge to build. "All the steel was brought out from England, Australia at that time didn't have any steel mills, so the steel was all brought out to Melbourne, fabricated in Melbourne, shipped to Rockhampton, then via rail, out towards the site, and then by teamsters to the property," he said. "It was really a magnificent effort when you think back 100 years. "For that area, it must have been an eye-opener to see such a magnificent building going up." The Isisford Race Club secretary Sally Edwards said today's opening may also encourage more visitors to attend tomorrow's race meeting. "We have a lot of tourists come through and they ask about the shed all the time," she said. "It is disappointing [that it's not open] but we just appreciate that we do have this time. "It is one of our historic icons in this community, it is our history, and it is something that we are proud of." An extra horse race has also been listed on the program at the Isisford race meeting, to celebrate the centenary of the Isis Downs shearing shed. Property manager Phil Dearden, from Consolidated Pastoral Company, said the shearing shed was a special building. "It's 52 stands - so certainly that would have been a significant number of sheep that would have gone through in a day," Mr Dearden told ABC Country Hour. "It was the first electric shed too, as far as I know in Australia - electric overhead gear - so it was pretty well ahead of its time. "It was a pretty unique set up for the time, and it is a unique shape, so I guess that is what makes it what it is." The Pastoral Company has not used the shed for shearing for 10 years following a move out of sheep, but said it has remained in good condition. The Isis Downs shed has radial trusses to frame the roof. The Deeargee shed is far more inventive and uses an 'umbrella' type of central support to carry the roof framing without any central column. One has to ponder the origins of these sheds. Horbury Hunt is very likely to have been associated with the Deeargee building. The Isis Downs shed was fabricated in Melbourne. Are there any prototypes that these buildings were modelled on, or did they both originate from an idea based on improving light and ventilation in the hot Australian summers? Both books have a collection of photographs of shearing sheds with a short introduction and a commentary on each location.